The first Tahoe Weekly issue. Click to read it. 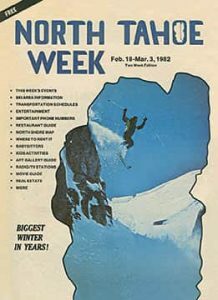 On Feb. 18, 1982, David Mogilefsky published the first edition of “North Tahoe Week” featuring a photograph by Vance Fox of a skier cliff jumping near the horse trails in Squaw Valley. That first edition was 12 pages and was full of information about local resorts, babysitters, events and things to do in North Tahoe and Truckee area. Lift tickets were $20 at Squaw Valley, and advertisers included realtors, art galleries and restaurants. The cover featured a photograph inside a hand-drawn outline of Lake Tahoe, and the only editorial feature was the tongue-in-cheek Yesteryear column that featured fictional news from the past. Tahoe Weekly has gone through several names changes through the decades, and in 1997 was purchased by Dale and Shirley Good. The Good family operated Tahoe Weekly for nearly 17 years, before longtime Editor & Associate Publisher Katherine E. Hill purchased the magazine in 2013. Through the decades, Tahoe Weekly has gone through many name changes, and is known for its iconic covers of breathtaking scenery and of locals enjoying the lifestyle that living in the Tahoe-Truckee region affords. It has grown into a magazine that chronicles the remarkable people and places that define our community. Today, the magazine is filled with local voices from our columnists and staff, to the many freelance writers and photographers that are a part of each edition of Tahoe Weekly. “Everyone who is a part of putting together every issue of Tahoe Weekly magazine shares a passion of our community, and it shows in the magazine that we produce,” says Hill. A few years ago, Tahoe Weekly adopted the new slogan “Capturing the Spirit of the Tahoe Sierra Since 1982.” That spirit means reflecting the indefinable force that draws each of us to the Tahoe-Truckee area; a spirit that is different for each of us.